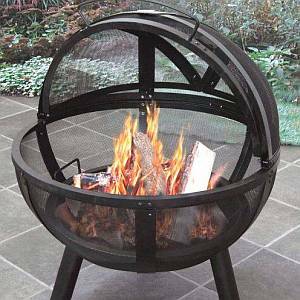 Outdoor Fire Pits, Rings, Fireplaces and Chimineas to warm you up! Why retreat to the warmth of the indoors once the weather turns chilly when you can warm up on your deck or patio with one of our many styles of beautiful and affordable Fire Pits? Stay cozy in the crispness of autumn and winter, and enjoy outdoor meals all year round and they help extend the time you can use your patio, deck, or backyard. Fire Pits are a decorative way to get the feel and warmth of a real wood fire crackling in your own backyard. Many of our outdoor fireplaces even come equipped with wheels for easy portability, so you can quickly move your fireplace from deck to patio to pool side. You may even wish to take your outdoor fireplace with you on your next vacation! 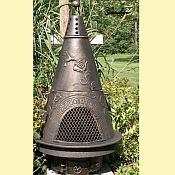 Alternatively bring distinction to your patio, deck, or backyard with one of our unique Chimineas. The chiminea was originally designed and constructed by Mexican artisans to be used as a bread oven, but its charm and beauty have enchanted people for centuries. 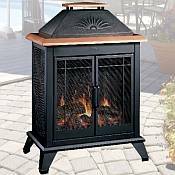 Today, the chiminea is still a favorite choice for providing warmth during cooler weather. Going camping? 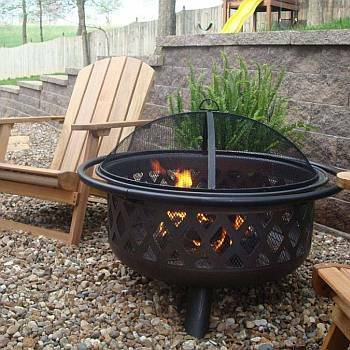 A fire ring is a safe way to contain a camp fire and can be used year-round. Roast marshmallows and hot dogs during your next camping trip when you bring along one of our sturdy, easy to assemble Fire Rings. All of these are available at affordable prices; many are portable and very easy to use. Attractive and simple to clean, the designs create a slow burn for a warmer, longer lasting heat without sparking embers. 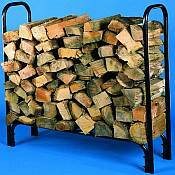 An outdoor fireplace or fire pit burns wood, charcoal, or pressed wood logs. Some assembly may be required.